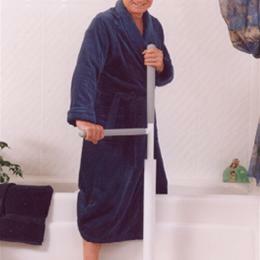 The Advantage Rail™ is a floor mounted support rail which promotes safe and independent standing and transfers. The key to the effectiveness of the Advantage Rail™ is in the unique operation of the horizontal rail. The rail pivots to move with you in safe small steps providing moving support similar to a walker, yet it can lock in an instant in case of a loss of balance, need for rest, or to assist to a seated position. Highly Effective Support - pivoting feature allows the horizontal rail to be positioned where it can provide maximum support. Security-locking feature provides excellent stability while pulling laterally for transfers. Wider Support Zone - the Advantage Rail™ supports wider area for increased stability and multi-step transfers. Flexible - height adjustable to accommodate your specific needs.